He made no mention of what he was doing moving forward. 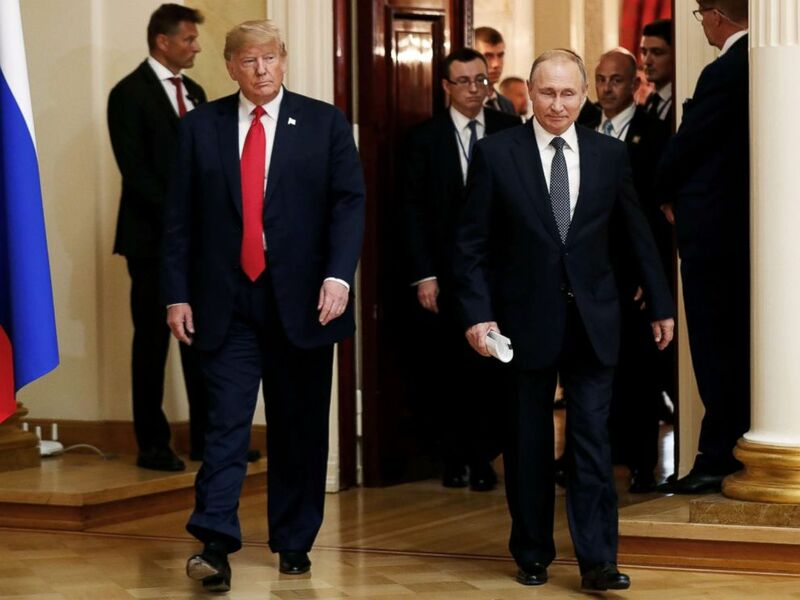 In case there was any doubt, President Donald Trump made clear Monday the specific evidence U.S. law enforcement and Congress have laid out about how Russian agents actively sought to intervene in the 2016 elections is not a top concern for him at all. What’s more, he is not sure he believes it. The first question of the event was straight to the point on election security and accountability moving forward. “Mr. President, you tweeted this morning that 'US foolishness, stupidity and the Mueller probe’ is responsible for the decline in US relations with Russia.' Do you hold Russia at all accountable for anything in particular?” a Reuters reporter asked. “I do. I hold both countries responsible,” Trump replied. And there, right off the bat, it was clear Trump had little interest in pushing back against Putin or his government over this apparent affront and attack on U.S. institutions. Trump went on to say, “I think we have all been foolish,” and then he pivoted to the issue of collusion and denied members of his campaign worked with Russians. “There was no collusion at all. Everybody knows it ... That was a clean campaign,” he said. This statement was exceptionally telling, as it seemed to get to the heart to what President Trump does care about: his election victory. During the follow-up question by the Reuters reporter, Trump waxed on about his Electoral College win, repeating old lines about the U.S. electoral systems favoring Democrats. “I beat Hillary Clinton easily. ... It’s a shame there could be a cloud over it,” he went on. That was what mattered, more than anything else. During his opening remarks, Trump said Putin had an interesting idea about taking on cybersecurity in terms of elections. 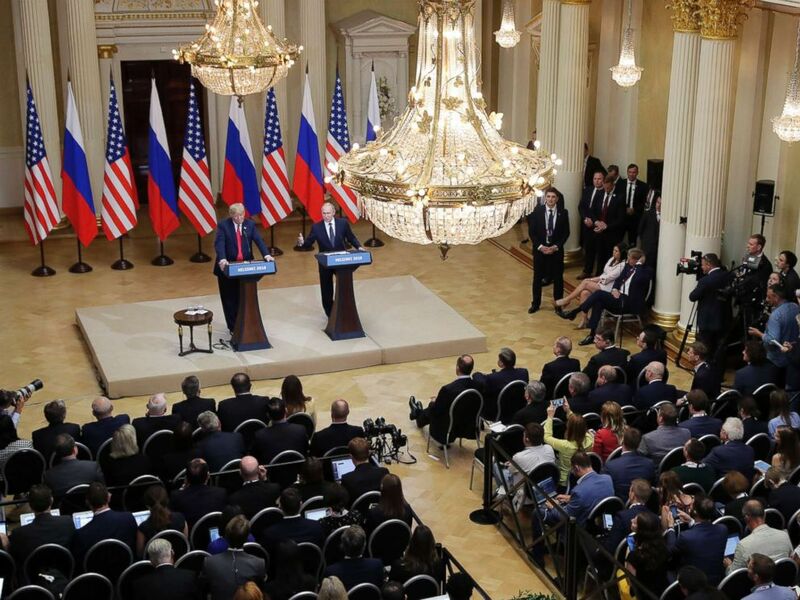 Later, during the question and answer, Putin talked about a joint commission and even offered to let special counsel Robert Mueller’s team into Russia to interview Russia agents, if (a big "if") the U.S. let Russians in to investigate possible spying or actions impacting Russia, too. This concept of taking on cybersecurity together is not new. President Trump tweeted about it last July, only to withdraw the idea after receiving stern blowback from members of his own party. It is likely European allies, who have talked about Russian propaganda campaigns and attempts to sway public opinion in their own elections, would also oppose (or write off) the idea of Russia being a leader or role model in this space. Not only did President Trump do little to reassure Americans he would hold Putin accountable for allegedly attempting to sow discord in 2016, but he also undercut U.S. law enforcement’s conclusion’s entirely. When asked who he believed more -- U.S. intelligence agents or President Putin -- and whether he would warn Putin to never try something like this in the future, Trump replied with a rambling answer about Hillary Clinton’s emails. He said he still has not seen what he claimed was Clinton's "missing server" or what he claimed were “missing” servers from the Democratic National Committee. “I have President Putin, he just said it's not Russia. I will say this. I don't see any reason why it would be,” Trump went on, as if accepting Putin’s denial. What’s amazing about this is that the indictment, being prosecuted by the Justice Department and green-lit by a grand jury of Americans reviewing the case, was extremely detailed. It listed email addresses the Russia military officers reportedly used, as well as techniques, methods, locations and conversations the foreign agents had. Still, when given the opportunity Trump did not say he believed U.S. intelligence. n Intelligence. The president must appreciate that Russia is not our ally...The United States must be focused on holding Russia accountable and putting an end to its vile attacks on democracy." The moment made President Trump look a little more interested in an honest relationship than the guy standing next to him. Former Acting Undersecretary for Intelligence at the Department of Homeland Security and ABC News contributor, John Cohen, wrote in response to the press conference, “My biggest concern is whether others across the globe will view the president of the United States as weak or even subservient to Putin." That’s a bold question, but one that many of President Trump’s critics in the U.S. have been asking for quite some time. Why isn’t the president releasing his tax returns? Some Democrats have wondered if assets buried in Russia could be the reason. From that campaign opposition research “dossier” to the president’s reaction to the Mueller probe, the theories have gone on and on. Putin did not say simply that he did not have material. Instead, he basically brushed off the question. “I treat President Trump with the utmost respect, but back then when he was a private individual, a businessman, nobody informed me that he was in Moscow,” he said. Following the event, Minority Leader Chuck Schumer, D-N.Y., tweeted, "Millions of Americans will continue to wonder if the only possible explanation for this dangerous behavior is the possibility that President Putin hold damaging information over President Trump."